Welcome to another day in DISNEY WEEK!! 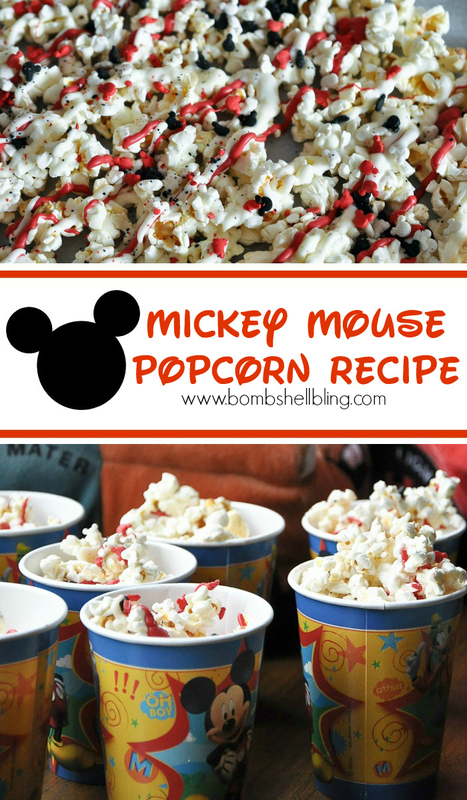 Today I am excited to share with you the Mickey Mouse Popcorn that I made for my son’s DisneySide birthday party. 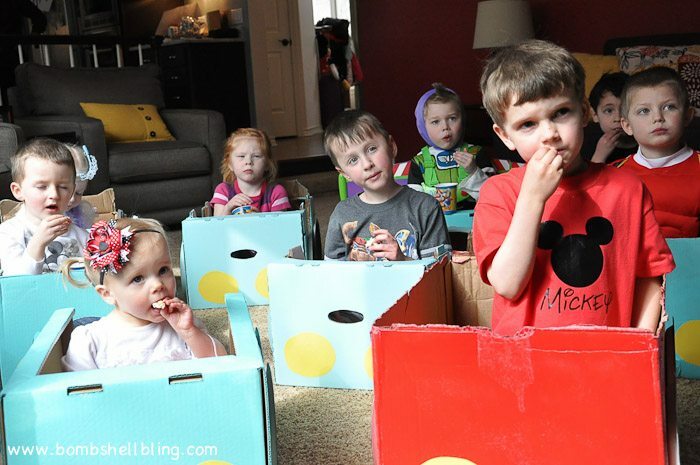 It was part of Mater’s Tall Tales Drive-In, and it was a huge hit with the kiddos! 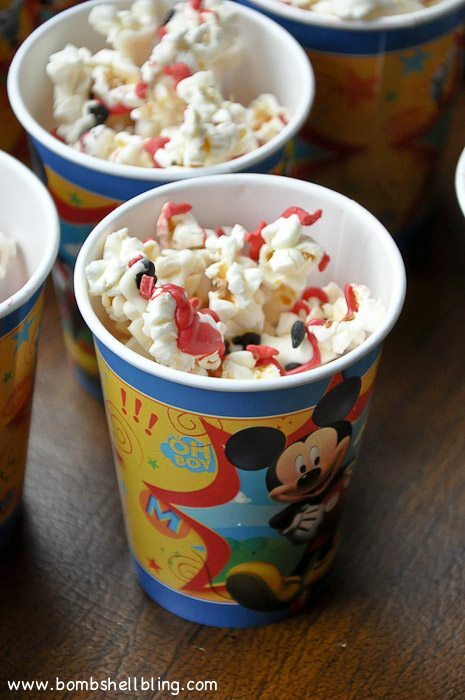 This Mickey Mouse Popcorn was made with kettle corn, candy melts and vanilla bark, and Mickey Mouse confetti sprinkles. The process is pretty simple, and I have shared it before in my other popcorn recipes. In short, I pop the popcorn and spread it out. 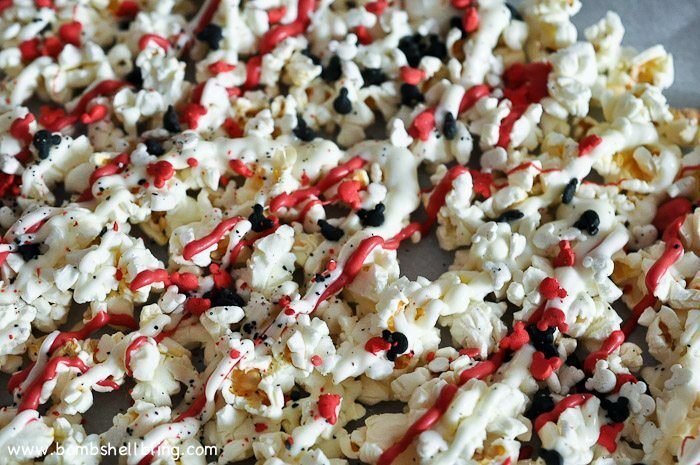 Next I melt the candy melts and vanilla bark and drizzle it over the top of the popcorn. Lastly I sprinkled the Mickey Mouse confetti over the top of the melted candy melts. That’s it! The specifics are shown below. Pop 1 - 3 bags of kettle corn and spread them out on top of parchment paper. Melt the red candy melts in the microwave following the directions on the bag. Spoon the melted candy into a sandwich sized ziploc bag. Snip the end of the ziploc bag off and drizzle the candy onto the popcorn by waving it back and forth over the popcorn. Repeat this process with the white vanilla bark. 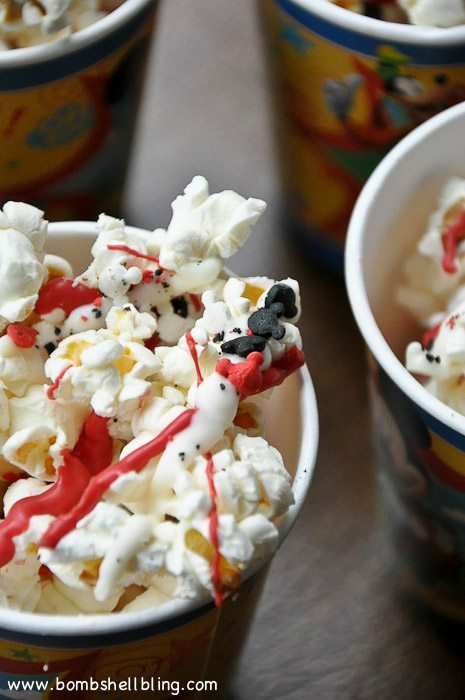 While the vanilla bark and candy melts are still warm toss the Mickey Mouse sprinkles all over the top of the popcorn. Once the candy melts and vanilla bark have cooled break the popcorn up into large pieces and serve. Here the popcorn is in action at Mater’s Tall Tales Drive-In. I can’t wait to show you the full party!! Be sure to check out the rest of the Disney Week tutorials and enter to win $150 to the Disney Store! If you love Disney and Pixar as much as we do, and you are thinking about taking your little ones to “The Happiest Place on Earth,” then you should check out the travel agency Get Away Today. They have vacation LAYAWAY PLANS! Isn’t that brilliant?! Paying off your vacay a bit at a time makes it so much more realistic and affordable! Check out their amazing discounts and packages, and be sure to use the coupon code BLING to get an additional $10 off of your booking! What a SWEET and YUMMY idea. 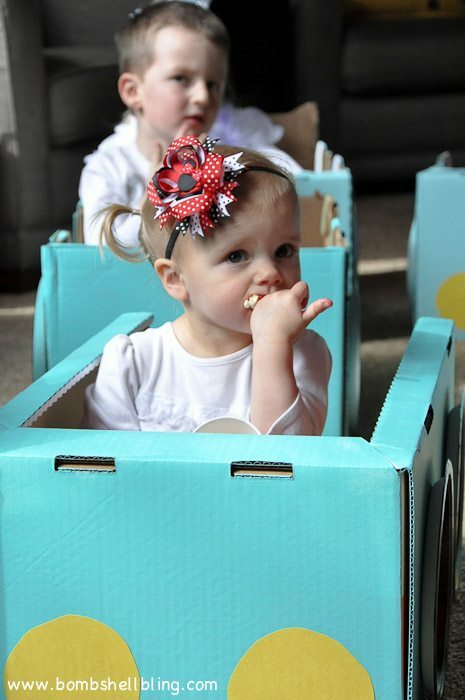 So Cute and love all the little cardboard cars, so FUN!!! Can this be done a day ahead?